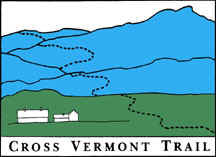 The Cross Vermont Trail is a shared use path. Expect to encounter others, some of whom may be using the trail in a different style than you do. Be prepared by bringing your good manners. Good manners are to a multi use trail as a chain is to a bike, or laces to a shoe. Travel on the trail in a regular way. Follow the conventions you are familiar with from driving on roads. Travel on the right, pass on the left, do not weave in and out of traffic, do not pull out suddenly in front of people, adhere to instructions on signs. The trade off with a shared us path is that no one gets to go for broke, pell mell. (If you want that experience, look for a single purpose, one way trail. A bobsled chute, for example.) This doesn't mean always going slow, it just means never going "with complete abandon" - be prepared to yield. Yield means "slow down, communicate with the people you are meeting, be prepared to stop if needed, then proceed safely." People headed downhill yield to people headed uphill. Take up no more than half the width of the trail. If in a group, this may mean spreading out in single file. If trail is narrow, may mean being prepared to step to the side to let others pass. Watch and listen for others. Allow faster trail users to pass safely. If stopped (such as to talk, rest, take in the view, and what not), move off to the side, out of the way. Pass on the left, when passing people travelling in the same direction as you are. Give calm, audible warning. Give person you are passing time to react before you pass them. When approaching people travelling towards you, make eye contact, say hello, be prepared to yield if there is need, keep to the right and proceed. Dogs are asked to behave with the same etiquette as all other trail uses. They should show good manners, be consistent, be prepared to yield, not block the trail, and pass safely. In practice, this means they should be "under immediate control" of the person responsible for them. Start with the one on the left, and work your way in. They will have been set out in the correct order by your hosts; typically oyster, followed by fish, meat, salad, and dessert.